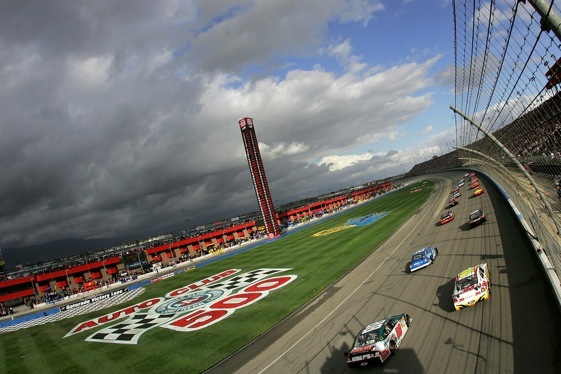 NASCAR’s latest tactic in trying to lure the ticket-buying public away from their bountiful other Sunday activities and out to the 2.0-mile oval has been to award Auto Club Speedway a Chase date. Jeff Gordon, a native of California: “I mean certainly this used to be a night race and now it’s a day race and certainly this time of year is the perfect time of year for us to be here weather-wise. You just can’t beat this weather. Track temperature and everything is just perfect for the race cars. Anytime that we come out on the West Coast, the teams are happy to have a day race because that means we get back home at a fairly decent hour instead of a day later and doesn’t shorten our week up. Going into the Pepsi 500, the one everyone is trying to catch continues to be Mark Martin (No. 5 CARQUEST/Kellogg’s Chevrolet), as he is 18 points ahead of second-place, Jimmie Johnson (No. 48 Lowe’s Chevrolet), the three-time defending series champion. Martin has posted a series-leading and career-high seven poles plus five victories. But the rest of the top 12 are not letting Martin off easy. A total of 190 points separate first place to 11th in the Chase standings, and only 99 points separate first to sixth – the closest points margin after the first three races of the Chase since the format’s inception in 2004. And to boot, three different Chase contenders have won the first three races of the Chase – (Martin, New Hampshire; Johnson, Dover; and Tony Stewart (No. 14 Office Depot Chevrolet), Kansas). “It just shows that you’re going to have to be on for 10 weeks to win this thing, and if you have a bad day, there’s going to be guys that are going to capitalize on it,” said Stewart. This weekend, Auto Club Speedway welcomes its inaugural Chase race, and returning race winner Johnson could benefit. Johnson is tied with Gordon and Matt Kenseth (No. 17 R&L Carriers Ford) for a series-high three wins at ACS. One of the Chase contenders has had a little more on his plate than the rest. Tony Stewart co-owns Stewart-Haas Racing and also drives the No. 14, and has been able to do both while competing for this season’s championship. Stewart heads to California this week coming off a win at Kansas Speedway that moved him up one spot in the Chase standings to fourth and closed the points gap behind Mark Martin to 67-points. Stewart has posted four wins, 14 top fives and 20 top 10s this season with the help of his crew chief Darian Grubb. Greg Biffle (No. 16 3M Ford) and Jeff Gordon (No. 24 DuPont Chevrolet) started off slow in the Chase for the NASCAR Sprint Cup, but have spent the last three weeks building momentum and climbing back into contention. Four-time series champion Gordon finished second at Kansas to move up into seventh in the points standings 103-points behind the standings leader Mark Martin. Gordon has posted one win (Texas) and 13 top fives this season, and is tied with Tony Stewart for a series leading 20 top-10 finishes. “Right now we’ve got to focus on our team and our program and our finishes,” said Gordon. “We got a little bit behind in New Hampshire, and now we’ve got to make sure that’s the worst finish that we have in the Chase. That’s the only chance that we have, and that’s asking a lot, but that’s now our goal. It’s the position we put ourselves in,“ said Gordon. Gordon heads to Auto Club Speedway tied with Jimmie Johnson and Matt Kenseth for the series most wins at the 2-mile track with three (1997, 1999, 2004), and has posted nine top fives, nine top 10s and two poles in 18 starts. Biffle has had the tallest ladder to climb this season, after being seeded 12th coming into the Chase, and climbed he has. Biffle is eighth in the Chase standings 114-points behind Martin. He has posted nine top fives and fourteen top 10s this season. In the first three races of the Chase, Biffle has finished in the top-10 twice. Biffle won at Auto Club Speedway in 2005, and has also posted four top fives, and four top 10s in 13 starts. The Chase reaches the halfway point next week when Lowe’s Motor Speedway hosts the fifth race in the 2009 Chase for the NASCAR Sprint Cup — the Bank of America 500 — next Saturday, Oct. 17 (7 p.m. start on ABC). Jeff Burton (No. 31 Caterpillar Chevrolet) is the defending race champion. Last October’s victory at Lowe’s Motor Speedway was Burton’s third time winning at the 1.5-mile track. It also was car owner Richard Childress’s fifth win there.